If you have a questionable sense of humor with some disposable income to your name, here's something you can do: buy wrong website domains that totally look like the real thing. Like rnicrosoft.com for microsoft.com See what I did there? It's like wearing a fake Rolex but on the Internet. Some peopl won't even notice the difference! M-named websites are the easiest to fool people with because of how the letters r and n look right next to each other. It works for rnacys.com, rnlb.com, rntv.com, rncdonalds.com and rnyspace.com (though you might not want to spoof that last one). 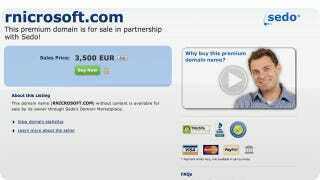 In fact, some people think it's such a good idea to buy lookalike websites that they're marking up these Folex website prices by a ton, rnicrosoft.com is actually being sold by Sedo, a domain marketplace, for $4,668. If you want a good fake, it's gonna cost you.